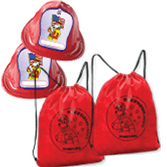 Fire safety is always in style with this Sparky® Fire Hats and Drawstring Sports Bags Set. Sparky Fire Hats are a great way to get kids to join Sparky's fire safety team -- and kids love to wear them! These fire engine red hats, made to last from sturdy plastic, feature a colorful Sparky the Fire Dog® emblem with space for the child to write his or her name! Sparky Fire Hats are the perfect giveaway at schools, community outreach events, and at station tours. Pair a fire hat with a drawstring bag featuring Sparky the Fire Dog® and his "Team Up for Fire Safety" message and you've got a winning combination! Plus, you'll save $39 by buying this set instead of purchasing the items separately. This durable, lightweight polyester bag also features Sparky in the center in bold black. String shoulder straps on the backpack loop allow for quick closure on the run. Order today!